In my January 8th 2015 post, I told you about my plight as an acraphobic skier. I opened up and admitted that I am afraid of heights which is kind of strange for a skier. But I suffer through the aerial tram rides and chairlifts to get to the top. Now, I bare my soul again and reveal a hidden vice that due to my upbringing in Catholic guilt ridden hell, I must reveal. I am an addict. I am addicted to cinnamon rolls and sticky buns. Sadly, this aversion to healthy eating began with my wife’s grandmother Thelma Curren, who made hot, fresh sticky buns in the oven and called me over to my future in-laws house when they were ready. I was not a coffee drinker at the time, and prepared for the feast by bringing my own freshly squeezed orange juice and enjoying my own rack of buns with raisins. These were prepared especially for me much to the chagrin of my future brother in laws and my future wife Janet. How dare Mrs. Curren make Pat McCloskey his own batch. I loved every bite. Fast forward to riding my road bike at the Jersey Shore. 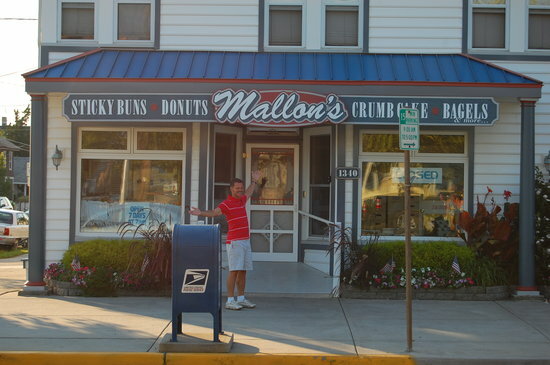 As I make my 50 mile round trip to Cape May and back to Avalon, I justify my stops at Mallon’s, which after much research, I found to have the best sticky buns at the Shore. I bring a rack back to my family who devours them with glee and then they tell me to never bring them back again. Their perpetual diets are sabotaged by this practice so after the first rack, I ride to Mallon’s and eat a rack by myself, sweating and stinking all over their outside bench. The minimum order is 6 buns and if I cannot inhale them all with a coffee, I sneak the rest back to the condo and hide them in the fridge. I make my way back from the beach feigning a bathroom break and sneak the buns out to the microwave an no one finds out. This helpless habit continues to this day on ski trips. I volunteer always to go to the grocery store after skiing and sneak a bun or a roll on the way back. I find the great bakeries. 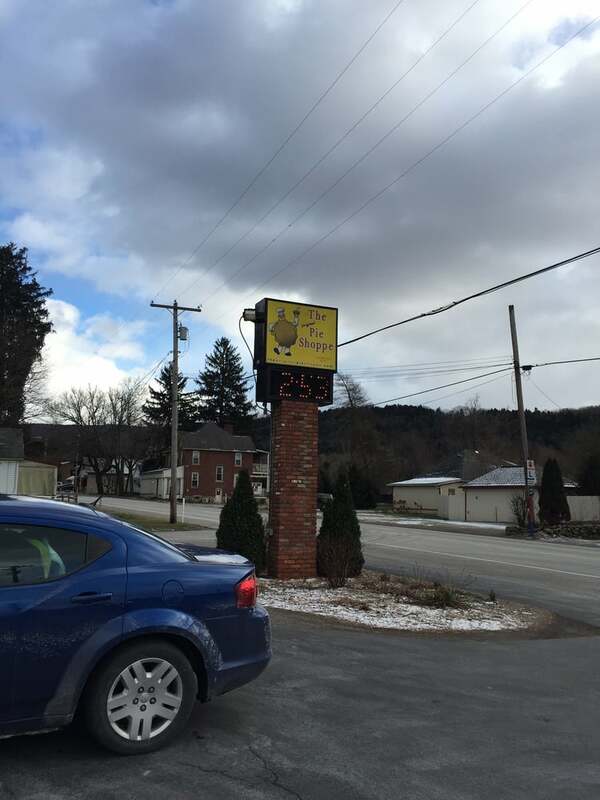 A weekly ritual in the winter, locally, is to stop on the way back from Laurel Mountain and eat a couple of cinnamon rolls from The Pie Shoppe in Laughlintown. Nothing makes the drive home easier than a coffee and a couple of rolls. I used to bribe my son Jack to come skiing with me by enticing him with a visit to the Pie Shoppe and he always bit. Now beer is a more likely bait for him. But not for me. As much as I like my IPAs, I will take the buns and the rolls first and foremost. 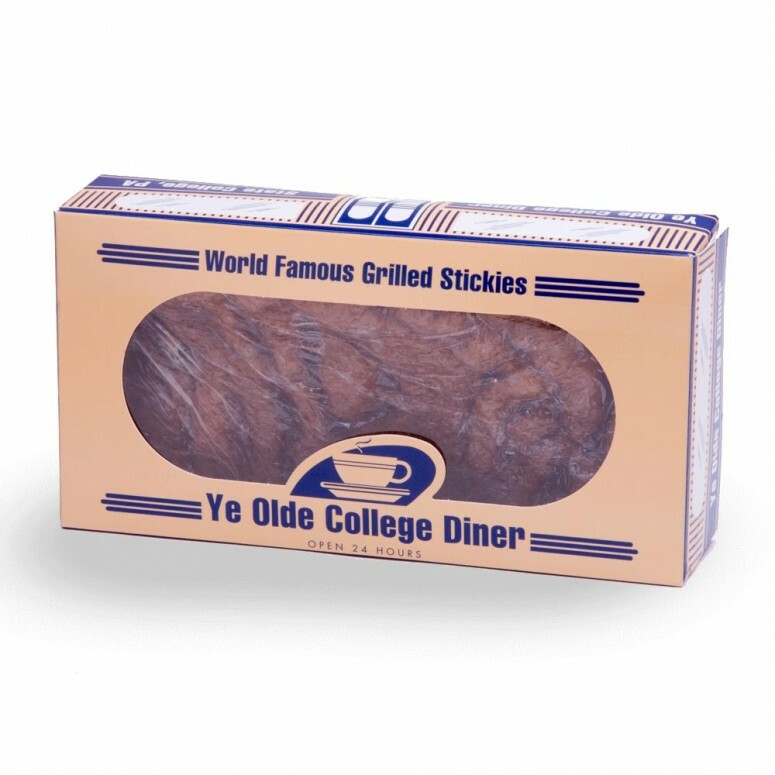 Penn State people like my wife will extol the virtues of the grilled stickies from Ye Old College Diner in State College, Pa. These mass produced beauties are great grilled and can provide a doughy base in your stomach after an all star night on the town. But something is lost on me with these buns when you can buy them in the local grocery stores as well as at the Diner. 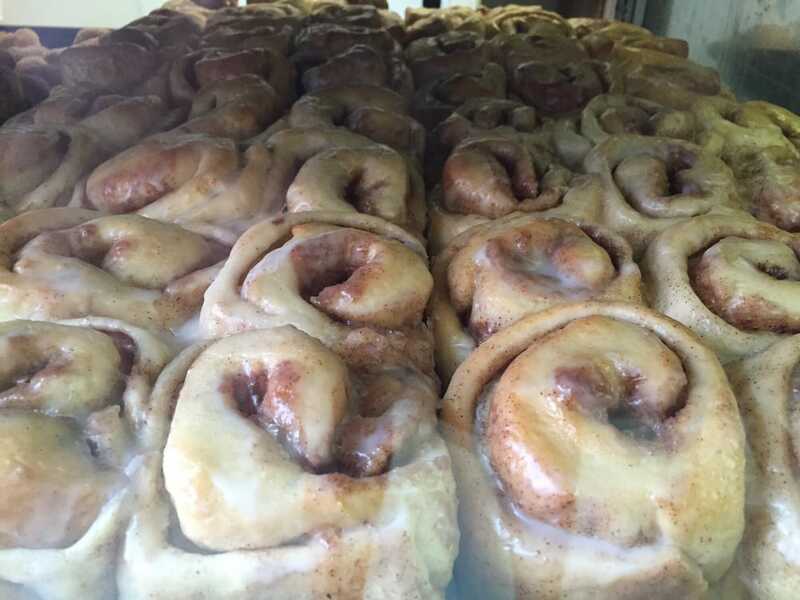 The fresh, warm bun or cinnamon roll right out of the oven in a great bakery cannot be beat. I know my health conscious friends are rolling their eyes at me now and even though I try to eat mostly healthy fare, I can’t help myself when tempted with these treats after a great ride or a ski day. But I know other people slip, like my chiropractor who is deeply into holistic health. Even he goes off the wagon here and there by buying a bag of cookies from Whole Foods and devouring them before he gets home. I outed you Ray. Guilty people love company. The only justification for this aversion to healthy eating is my diligence in trying to pay for the indiscretion. I truly think in my mind that I can run off that bun or cycle off that roll. I will sweat like a dog trying to burn up that treat and in my mind, after a vigorous workout, I have paid the price. Only to be tempted again in a day or two and the whole vicious cycle of sin and penance begins anew. As I have grown older, I have finally found the holy grail of cinnamon rolls dangerously close my home. The Bartram House Bakery has, hands down, the most delicious, cinnamon packed, warm doughy treat one could ever consume. It is so decadent that I find myself paying for it with an over extreme workout. Instead of being a connoisseur of the sticky bun and the cinnamon roll, I have become a common sewer with weekly stops. What am I supposed to do? This sweet toothed practice haunts me as I struggle to lead the healthy lifestyle. So there it is. I have outed myself, dropped my drawers and told you of the struggle that plagues me. I have come out of the closet much like a drinker and the first step to redemption is to admit it. But, chances are, you will catch me sometime with a smile on my face and icing all over my chin. Thanks for reading. 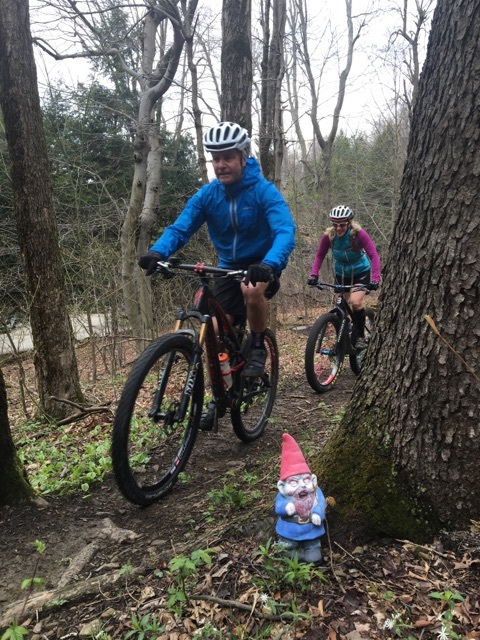 This entry was posted in Aging, American Culture, Culture, Cycling, Health, Humor, Mountain Biking, Skiing and tagged Bartram House Bakery, Mallon's Avalon, New Jersey, Pa, The Pie Shoppe - Laughlintown, Ye Old College Diner. At least you have standards for your vices. My vice is cheese, and my health suffers because I have almost zero standards for cheese. I will eat and enjoy anything from Kraft Singles to an extensive gourmet tray appetizer somewhere on Mt. Washington. I love me a good cinnamon roll, but my taste buds have a steep climb (but no too steep as I don’t want you to get sweaty palms thinking about the height) to diminishing returns when it comes to sweets. But for whatever reward I get for not craving sweets, I more than destroy with a plate of mazza sticks! But hey, life is meant to be enjoyed and if sacrifices are made in other areas in order to indulge in a vice that truly makes you happy, then that is okay in my book. So keep those buns and rolls coming…in moderation! Wow, I didn’t know those were videos. They just show up at pictures in my email. I just watched this most recent one and liked it. Video is a finicky thing. I think if you are going to go down that road, you have to be committed to it. You definitely have the character to pull off video, but there is always risk losing the mystique of your post. Kind of like seeing a book turned into a movie or hearing an author/director talk about their art and why they did what they did. Sometimes it takes away from the version or voice in the readers head which allows them to relate in their own way to what they are reading. The Pie Shoppe in Laughlintown is very handy and I try to drive right by it. But YOU might need a cup of coffee for the road . And some coffee can be pretty bitter. Therefore, you might need a cinnamon roll to balance it out…..and cinnamon is good for your blood pressure.